Neiel Israel, top Boston poet. 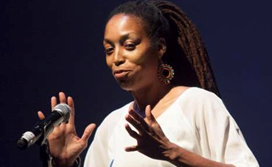 Neiel Israel is an internationally acclaimed poet, vocalist, and arts educator. Emerging from the Boston spoken-word scene, she quickly distinguished herself as a powerful, and lyrical poetic force. On a roll for 2016, she will represent the Boston Poetry Slam at both the National Poetry Slam and the Individual World Poetry Slam. She has previously represented the Lizard Lounge at Nationals (2011-2015) and the Women of the World Poetry Slam (2011). Performing with such noted spoken-word artists as The Last Poets, Askia Toure, Aldo Tambellini, and Jessica Care Moore, Neiel has featured in venues across the United States including the Nuyorican Poets Café, Bowery Poetry Club, Literary Café, Oberon, African American Literature and Culture Society, Verbalization, Society of Urban Poetry, Simply Poetry, Gallery 55, Pierre Menard Gallery, Fuller Museum, Wally’s Jazz Club, The House Slam, Slam Free Or Die, Art Is Life Itself, AAMARP, First Friday Youth Open Mic, If You Can Feel It You Can Speak It, Rhythmic Cypher, Mass Art Poetry Alliance, Bigger Than Hip Hop Cultural Collective, Poetry Ambassador Inaugural Event, Boston University, Northeastern University, Harvard University, University of Massachusetts Dartmouth, Worcester State University, Berklee College of Music, University of Massachusetts Boston, and Massachusetts College of Arts. Neiel has a B.A. in English, and graduated with honors, from the University of Massachusetts Boston. As an international teaching artist, Neiel leads workshops and classes in creative writing for schools, community programs, and colleges. She is presently the America SCORES Boston Poet in Residence, serving eleven elementary schools and four hundred eleven students.